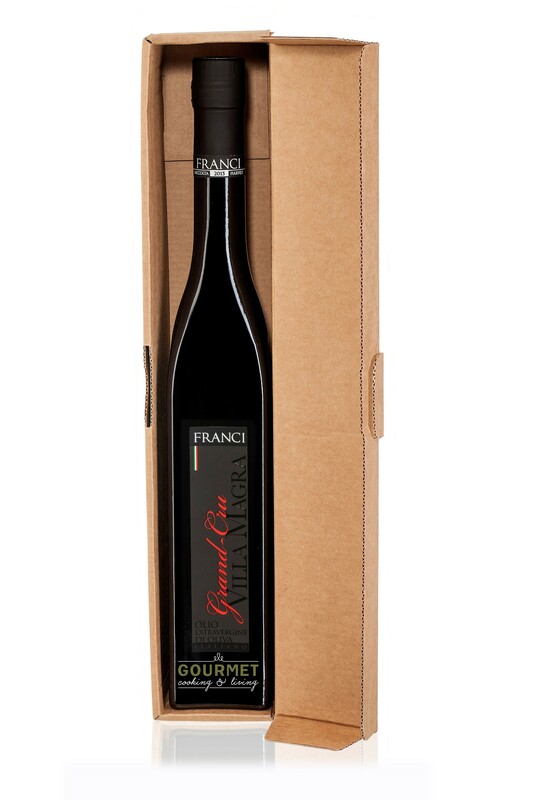 Villa Magra Gran Cru has a fragrance that is fresh, intensely grassy, and has a predominant aroma of artichoke, cardoon, and green almond, which is enhanced by floral and cherry hints that create an extremely complex bouquet. The taste is solid with strong undertones of spice and exemplifies a harmonious marriage between fresh herbs and a long persistence of smooth, aromatic notes. Best used strictly fresh to contrast the sweet flavor of potatoes, beans, chickpeas and vegetables; on red meat or strong-flavored fish; with fresh cheese, such as ravaggiolo and mozzarella, which enhance the fresh, green features of the oil; excellent on spinach and ricotta tortelli; perfectly coupled with plain rice and pasta with thin slivers of parmesan. Buy 2 for $33.95 each and save 3% . Buy 6 for $31.50 each and save 10% . Frantoio Franci has given an outstanding performance as shown by its rich range of high quality products and the variety of prizes that have been awarded for over the last fifteen years. Founded in 1958, Frantoio Franci is set in Montenero d’Orcia, a small hilltop town on the slopes of the Amiata Mountains, overlooking the splendid valley of the Orcia River with a 10-hectare olive grove. In the founding year, brothers Franco and Fernando Franci purchased the famous Villa Magra olive grove and transformed the old barn into an oil-mill. The year 1995 marks a turning point in the history of the family firm. An important collaboration began between Fernando, with his lifetime of experience, and his son Giorgio, who brought a newfound energy and modern business skill set. All Frantoio Franci olive oils are labeled according to strict criteria of origin and quality standards defined by organoleptic characteristics and chemical parameters. In this way, they guarantee consumers consistent quality year after year. Oils which do not satisfy the predetermined criteria are downgraded. The seasonal variables which determine the quality of crop are a constant challenge. These variables can affect the quantity of the finished product but not their overall quality. The year of production has the power to determine that subtle and fascinating margin which separates a good bottle from an outstanding product. Frantoio Franci has won the most awards worldwide in the olive oil industry. It is the only producer to have won the “Leone d’Oro” prize three times, awarded by the “Maestri Oleari”, the most important and prestigious international olive oil competition, and to have won the “Ercole Olivario” prize 5 times - the two top awards in the olive oil industry. In 2005, it was awarded the prize for “Best Tuscan Oil-Mill”. The Slow Food Guide awarded Frantoio Franci top marks -Three Olives - for eight consecutive years, from 2004 to 2011. The olive oil Guide “Flos Olei”, edited by “Marco Oreggia”, named Frantoio Franci as “Best Olive Oil of the Year” in 2002 and 2005, “Best Olive Oil Mill” in 2003, 2008, and 2010, “Best Extraction Method” in 2009 and 2013, and “Best Olive Oil Blended - Intense Fruity” in 2011 and 2012, “Top Score”, 98/100, in 2013 with more than 3,000 olive oils competing every year from more than 42 different countries. In addition, Frantoio Franci has been awarded “The Three Leaves” in 2011, 2012, and 2013 from Gambero Rosso and the “Gold Medal” from 2006 to 2010, from the Los Angeles County Fair. Most recent “Best of Class” and Gold Medal at the 2013, 2014 and 2015 New York International Olive Oil Competiton. As of today, Frantoio Franci counts approximately 300 different awards that reflect the company’s outstanding work.